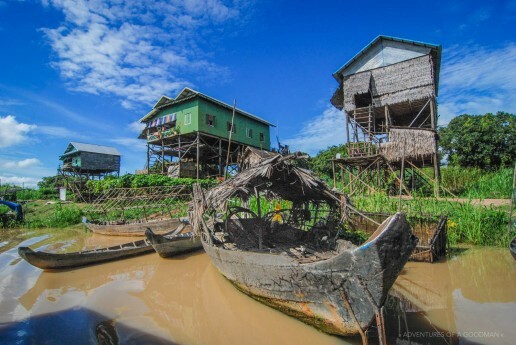 The Floating Village of Kampong Phluk is one of Cambodia’s most popular and unique attractions. Located mere 10 miles outside the walls of Angkor Wat, the entire village is built on wooden poles and stilts that lift each building 20-30 feet above the ground. Depending on when you visit Kampong Phluk, you might not even know those stilts exist. Every year during monsoon season, the Tonle Sap Lake floodplain rises up and submerges the stilts. As such, the entire village appears to float on the water. Surrounding the village is the Flooded Forest, which is home to a landscape of “floating” mangrove trees and a large variety of indigenous wildlife. 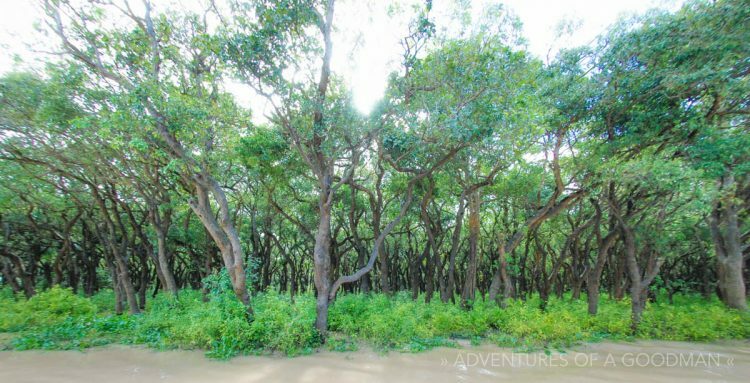 If you’re lucky enough to visit when the waters are high, you’ll pass through the forest en-route to Kampong Phluk. 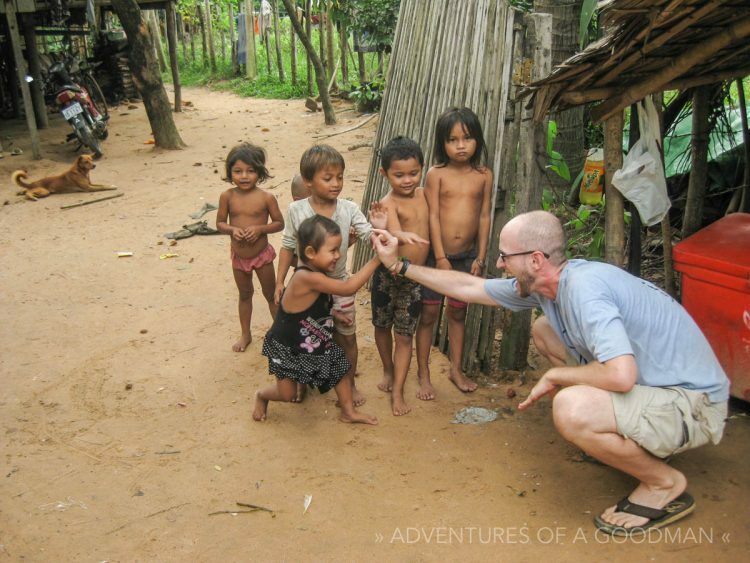 Regardless of when you visit, your tour will include a boat ride to the village. However, the way you get to that boat can be quite different, depending on how high the water is. During the monsoon season, the water is high enough that a tuk tuk can drop tourists off at the side of the river where the boat waits. During the dry season, a tuk tuk drops people off in a small town before transferring them to the back of a motorcycle. Next, that motorcycle drives down a bumpy dirt road to where the river is high enough for the boat to pick up passengers. My experience was neither of these, but we’ll get to that in a minute. My wife, Carrie, and I had one more day in Siem Reap and wanted to visit some more temples. So, we hired a driver, who promptly convinced us that a three hour tour to Kampong Phluk was a much better way to spend our day. So, we hopped into his tuk tuk and, after a brief stop for tire air and gas, we were on our way. It’s worth noting that the gas was bought from a shack on the side of the road, where it was being stored in a whiskey bottle. Once purchased, the gas was poured into the tank by way of a kitchen funnel. A short while later, while driving down a very rural road, we heard the unmistakable sound of a flat tire. Fortunately, we stopped right in front of a house that had an air pump. Unfortunately, after a half hour of trying to refill, patch and repair the tire, they eventually had to replace it. While waiting, I tried my hardest to befriend a dozen curious — but shy — local children by making faces, playing peek-a-boo and more. In the end, I won them over with high-fives. By the time we left, they were all smiling and waving and high-fiving each other. With our tire finally repaired, we headed back onto the road to the dock. Although monsoon season had begun, it was early enough that the road was still passable. Or so our driver thought. After driving for a while, we reached a point where two motorcycles were waiting. One would be driven by our tuk tuk driver, and the other by his younger brother. It seemed that the road was drivable, but only by a nimble two wheeled vehicle. Also, our tuk tuk needed another tire repair. While there were a few puddles in the dirt road, there was enough space for the bikes to maneuver around them with little effort … at least in the beginning. As the drive continued, the puddles became more frequent and the dirt road got more muddy. At one point, we reached a puddle that could be better classified as a pool stretching across the road. With no way around, our drivers sped up and splashed their way through shin-deep water and mud. As our motorcycles slipped and slid their way across, a steady wave of muddy water sprayed up and onto our bodies. I’m honestly surprised that the engines didn’t conk out, since they were submerged in water. This madness continued for quite a while, as the entire road ahead was covered in mud. Our drivers did their best to keep us from falling, but my bike hit the ground on four separate occasions. Fortunately, falling off a bike in a mud pit is more funny than painful, so it really wasn’t bad. As for Carrie, I guess the younger brother was a better driver, because he didn’t fall once. Despite the absurdity of the situation, no one ever mentioned the words, “let’s turn around.” Instead, we kept going until a local man stopped us and said that the road ahead was impassable: even for a motorcycle. So, with no other choice, we took off our flip flops and began to walk the final mile to the dock … barefoot. At first the walk was no problem; I even had fun sloshing around in the mud. However, shortly after we began walking, the road dried up and became hot and hard. Making matters worse were the tire tracks all over the road, which had hardened and become razor sharp. Needless to say, it went from a fun walk to a painful one very quickly; and laughing at the absurdity of it all was the only way I could keep going. At last … the dock! After walking for another half hour, we finally arrived at the dock. Here, our driver handed us off to the boat captain (a 12 year old boy) and the pilot (his 10 year old younger brother). Tonle Sap Lake, upon which the village of Kampong Phluk floats, exhibits a unique hydrologic phenomenon during the wet season – the river reverses direction, filling the lake instead of draining it. The engine of this phenomenon is the Mekong River, which becomes bloated with snow melt and runoff from the monsoon rains in the wet season. The swollen Mekong backs up into the Tonle Sap River expanding the surface area of lake more than five-fold, inundating the surrounding forested floodplain and supporting an extraordinarily rich and diverse eco-system. Disillusionment struck quickly upon arriving at Kampong Phluk, as it seemed that the villagers have tourism down to a science. At one point, a woman jumped onto our boat and got me to buy 10 notebooks to donate to the school children. When she got off, there were four other women waiting to do the same thing. Each was incredibly disappointed to find that she had beaten them to the punch. After spending a few minutes photographing the middle of Tonle Sap Lake, we were dropped off in the actual village of Kampong Phluk for a walk and tour. Upon landing, we were greeted by loud music, smiling faces, well-dressed locals and a winding parade greeted us, as we arrived just in time for a local Buddhist celebration. All around, people hoisted up money trees and other gifts for a group of monks who were about to enter a three month period of silence and isolation. We followed the parade to a hilltop temple, where the monks sat accepting the donations. Meanwhile, villagers banged on ceremonial drums as loud and hard as possible. The scene was amazing and the people were super friendly … though it was very awkward when I had to give out the notebooks. Originally, I thought we were going to walk into a classroom and simply hand the teacher a stack of notebooks. However, due to the celebration, all the schoolchildren were gathered in the street. So, at the urging of the girl who sold me the notebooks, I stood there and handed them out. One by one, kids came up, accepted the books, bowed their heads and said thanks. The whole thing seemed incredibly fake and scripted. Like, are these kids actually going to use them? Do they want them? Is the girl going to take the books back to sell to the next boat of tourists? I don’t know, nor do I want to. A local child saying hi! Um … so how are we supposed to get back home? Waving goodbye to the townsfolk, we got back onto the boat and mentally prepared ourselves for another epic muddy walk back back to the motorcycles. However, upon returning to land, we were thrilled to find that our guide had found an expert motorcycle driver to drive us through the mud. According to our guide, he was “the best driver in town.” Considering hoe easily he navigated through the mud and into dry patches, our guide may just have been right. If I had to pick one problem with the ride, it was the fact that the driest route was right up against a wall of spiky bushes, which frequently whacked us in the face, arms and legs. Still, we were too busy laughing at the absurdity of it all to care. Once back on our original bikes, the rest of the return trip was much the same as the trip out there. Lots of slipping and sliding, another trip through the pool puddle and a few near falls and crashes. Some time later, we arrived back at the village, boarded our now-repaired tuk tuk and enjoyed a spectacular sunset of oranges, reds and blues. By the time we eventually pulled into our guesthouse parking lot, it was well after dark, and our tour had lasted more than double the original 3 hour estimate. All worth it for the lifetime of memories we amassed during that long and muddy day.